Worshipping at the altar of Pinot Noir, thousands of Pinot lovers descended upon the Bacara Resort & Spa in Santa Barbara, ground zero for all things Pinot at the two day 2017 World of Pinot celebration. 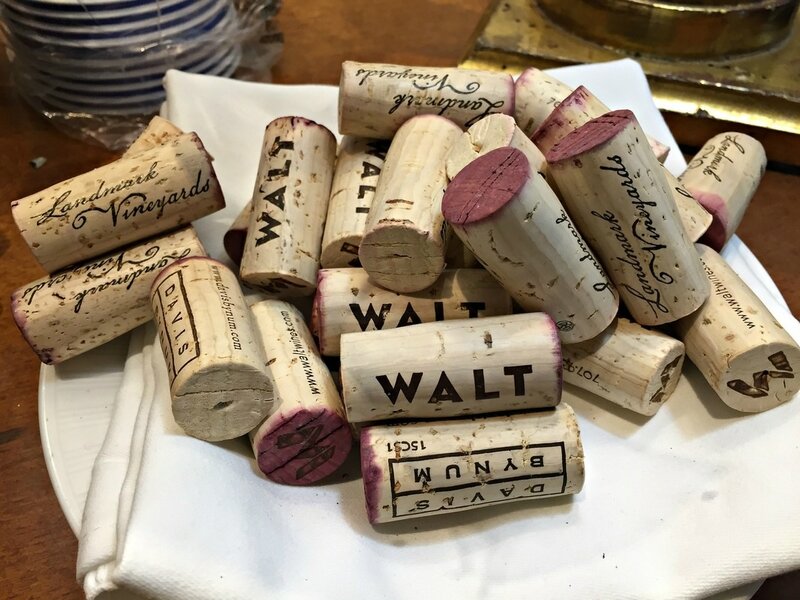 Enthusiasm ran high as the wine flowed, with Pinot Noir lovers checking out new wines and producers from all over the world, participating in a variety of seminars, grand tastings, and dinners. Pinot Noir, in all its splendor, was on display in the form of sparkling, rosé, and red wines, weaving a rich tapestry of what makes Pinot Noir so seductive. Overall trends this year? There’s a lot more sparkling and rosé Pinot Noir wines being made, perhaps a shift in consumers drinking habits, looking for Pinots for all seasons. These alternative incarnations of Pinot Noir were in full bloom at Friday’s Rosé Lunch, where thirteen wines were poured alongside a three course lunch. From pale pink to sheer raspberry in color, the wines differed in body and grip, but the essence of Pinot Noir emerged as a common thread. Kathy Joseph of Fiddlehead Cellars discussed her 2016 Pink Fiddle from Fiddlestix Vineyard, and found that the most important aspect is to “preserve the delicacy”. Her winemaking technique for rosé, “start like a red wine and finish like a white wine”, ensured the finished wine would have that Pinot Noir character, in a more delicate package. There’s also an increasing emphasis on single vineyard and clonal selections Pinot Noir, with winemakers seeking out complexity from many different factors. It’s a crash course in terroir, not just understanding the distinct differences in California’s many Pinot regions, from Sonoma to Santa Barbara, but also how France, Chile, and New Zealand stack up against California and Oregon. 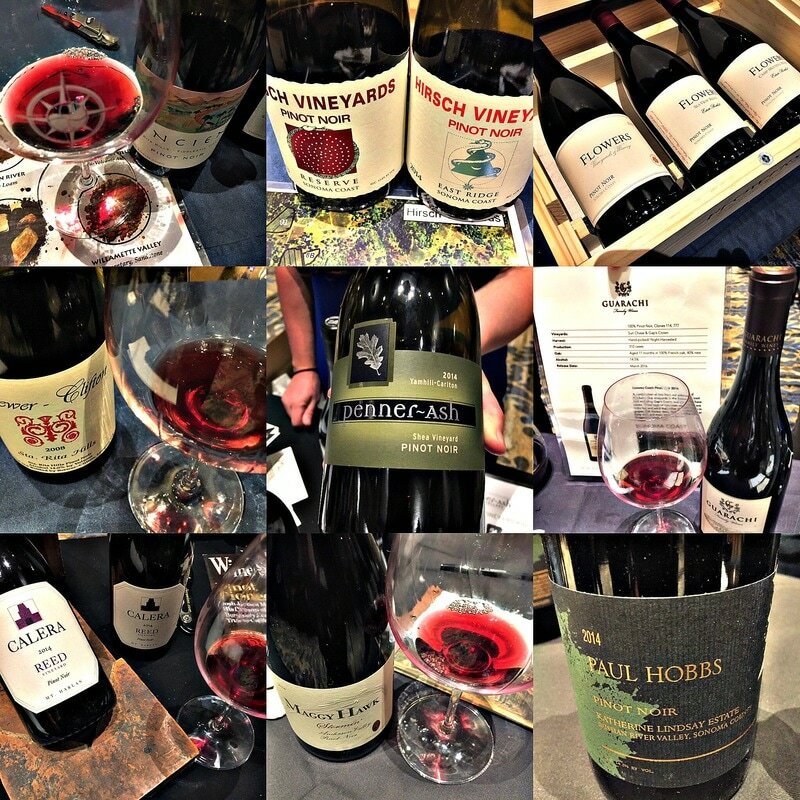 As a wine drinker, it’s a fascinating opportunity to taste in one place so many Pinot Noir wines, finding what appeals to you most, whether it’s the region, or a single Clone 777 or blend of several clones. 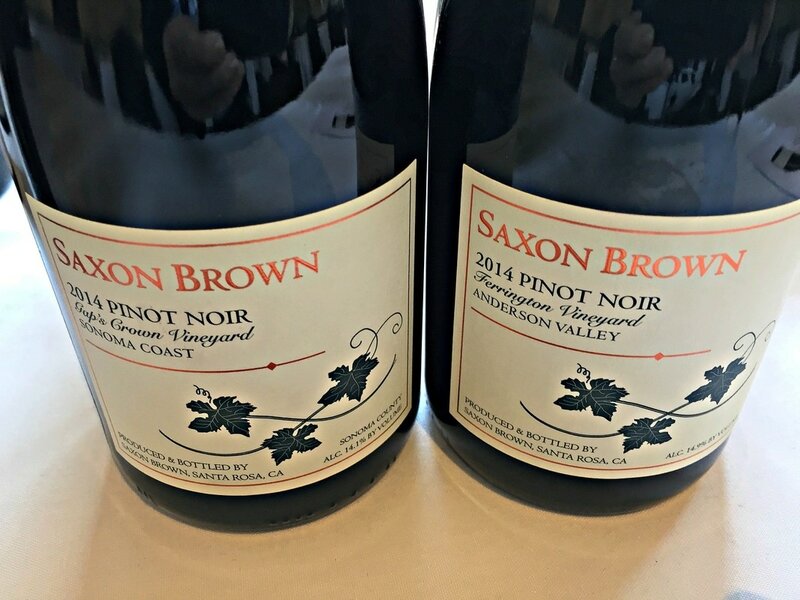 Jeff Gaffner, winemaker for Saxon Brown, put it best, “You wouldn’t cook with one spice so why would you make wines with one spice?” For Gaffner, this is best illustrated with his mesmerizing Ferrington Vineyard Pinot, “We have four clones coming together, we harvest and coferment them together, there’s something mystical that happens during cofermentation”. Indeed, that seems to be the essence of Pinot Noir, a hauntingly beautiful profile of fruit and savory notes, that better than most other varietals reflects its environment. At its heart, Pinot Noir channels cherry fruit, but winemakers have a big influence on what ends up in the bottle. Whether they do whole cluster fermentation or something as simple as picking the fruit earlier, winemakers definitely stamp their wines with a distinct identity. Will Henry of Lumen believes that the picking window is especially important for Pinot, “When you’re leading up to the moment where you want to pick, and you’re tasting the fruit everyday, and you kind of get green, green, green, and then all of a sudden there’s that magic moment, for a day or two, where the green flavors kind of vanish and go to the background, the real character and phenolics of the grapes start to show themselves, that is the moment at which we like to pick as soon as possible”. Henry notes that Lane Tanner, the Santa Barbara County winemaker behind the label, has the luxury of picking grapes at very different points because of the consistent and mild climate, but has eschewed the riper style wines, finding more complexity in restraint. 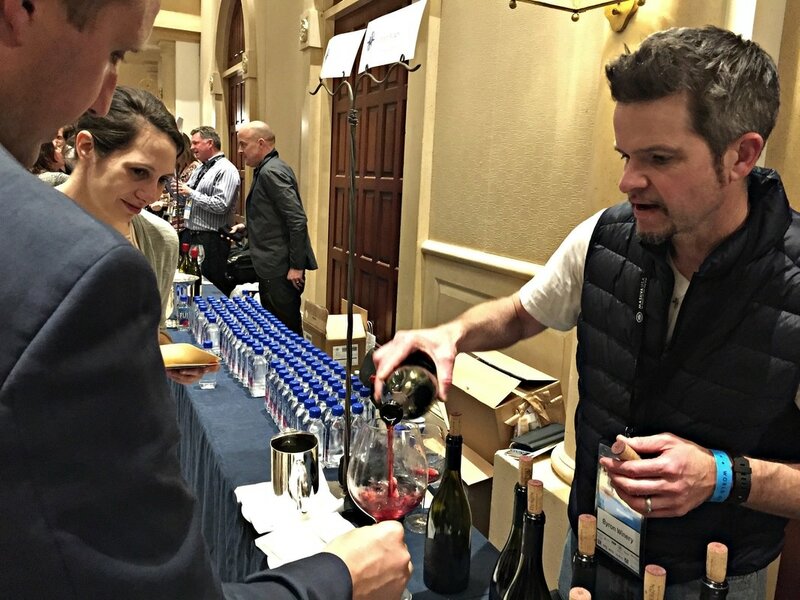 The Friday and Saturday afternoon “Pinot Noir By The Sea” grand tastings were simply the best, where Pinot’s legendary California pioneers, rock star winemakers, and up and comers in the industry poured samples side by side to a crush of serious Pinotphiles! 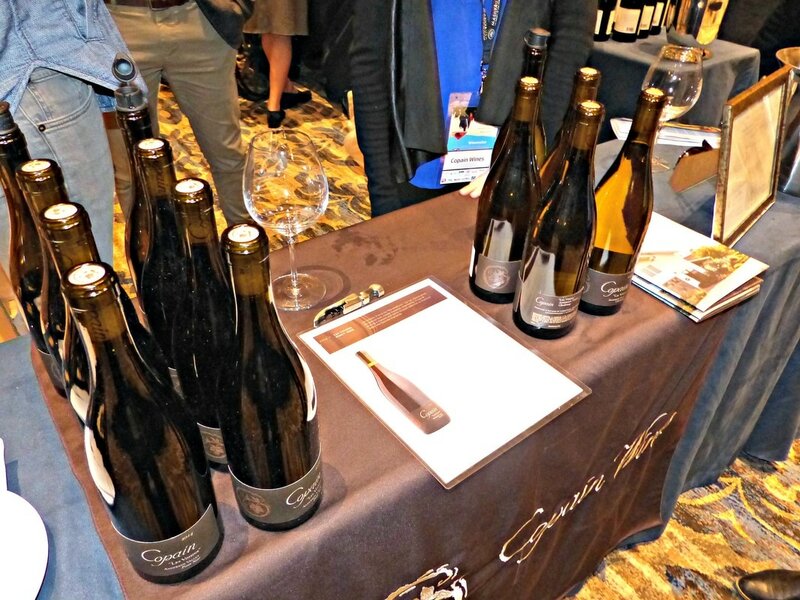 These were no average tasting events, serious wine collectors were on the hunt for old favorites and new sensations, while for many, it was a chance to really understand what Pinot Noir can be, from sparkling wines to still reds, from Old World to New World. 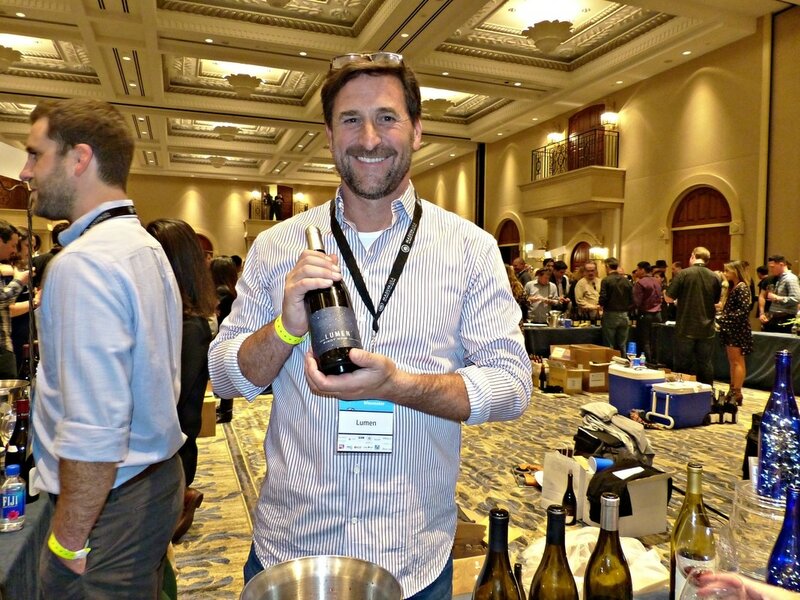 The winemakers added to the buzz, taking breaks to excitedly check out what other producers were pouring. 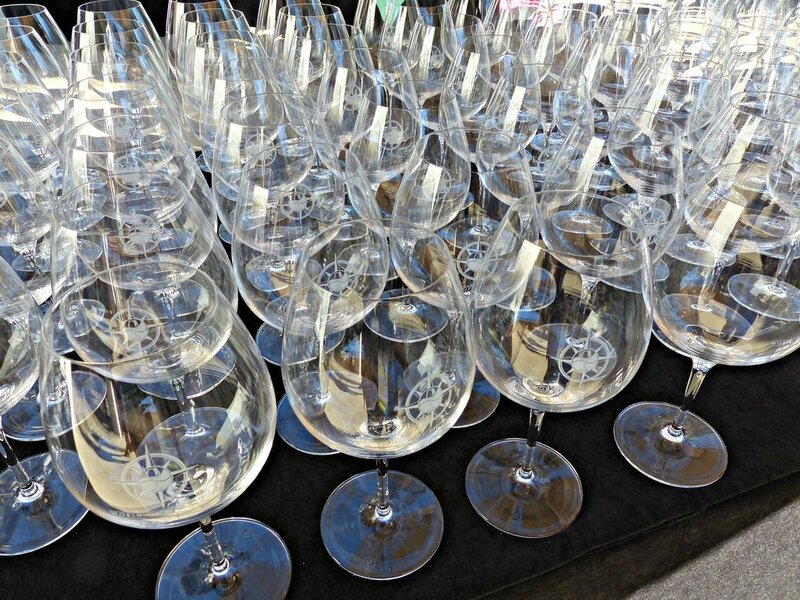 With so many wineries in attendance, it was impossible to check out everyone, but if you asked fellow tasters what they found on this wine hunt, valuable tips were swapped about the not-to-be-missed wines of the moment. Tasting over 100 wines during the event, here are a few of my highlights, apologies to all the many wonderful wines that aren’t included in this abbreviated list, yet deserve to be sought out! Most of the wines tasted were from the 2014 vintage, the producers’ current releases, which will benefit from time in bottle. California producers were the largest contingent, spanning the state from Santa Barbara to Mendocino. California is blessed with several pockets of Pinot-growing regions, and these differences were celebrated with single vineyard expressions from the different AVAs, even from different blocks within the vineyards themselves. Ancien - Winemaker Ken Bernards has an impressive collection of Pinots, like his mantra “Elevating fruit to art”, his gallery of wines is extraordinary. His single vineyard bottles, from the bold Fiddlestix Vineyard, alluring Sonoma Mountain “Red Dog Vineyard”, and Oregon’s earthy Shea Vineyard are quite different from each other, while the Carneros Toyon Vineyard is the best of both worlds, ripe fruit, spice, and earthy minerality. CIRQ - Michael Browne, of Kosta Browne fame, unveiled his Treehouse and Bootlegger’s Hill single vineyard Pinots to an eager crowd. These intense and layered wines fulfill Browne’s vision, to make outstanding wines from distinguished sites in the Russian River Valley. Cnagy - This is the passion project of Clarissa Nagy, who is also the winemaker for Riverbench. Winemaking runs in the family, as she is married to Byron winemaker Jonathan Nagy, and shares his love for Pinot Noir. The 2011 Santa Maria Valley and 2012 Garey’s Ranch wines are plush and exciting, showing extremely well with a bit of age on them. Nagy also poured a 2015 Bien Nacido Vineyard Pinot Blanc, a genetic mutation of Pinot Noir, so aromatic and delicious. Copain - Winemaker Wells Guthrie has infused these Russian River Valley Pinots with his own sensibilities, a Burgundian outlook that brings vibrancy and acidity to these elegant, nuanced wines, the Les Voisins Pinot Noir from Anderson Valley was poured. Gypsy Canyon - A link to California’s winemaking beginnings, this historic vineyard still has a small amount of Mission grapes to draw on, but as part of the Sta. Rita Hills AVA, their Pinot Noir is the star. 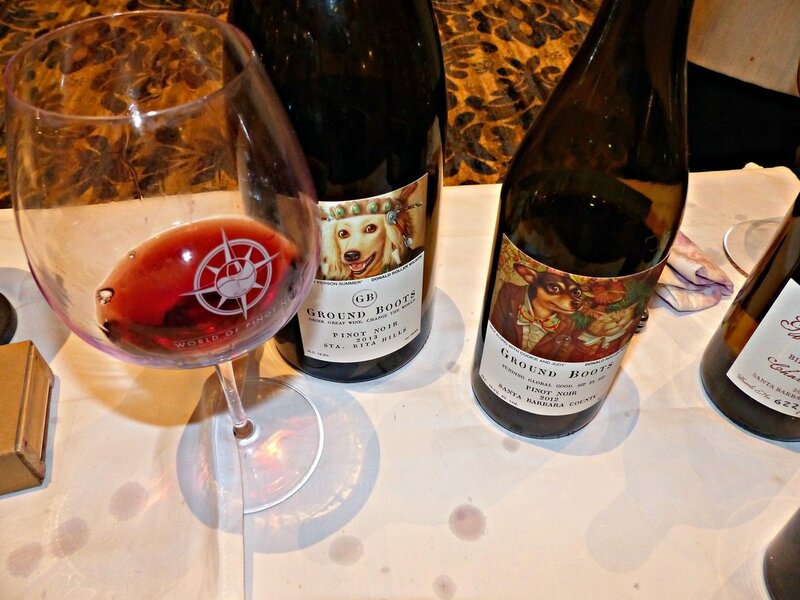 Winemaker Deborah Hall presented her Ground Boots Pinot, a racy and spicy wine whose profits go to animal rescue groups. Hall also poured a most unusual dessert wine, made from the ancient vine Angelica, and fortified with Mission brandy, all grown on her property. Working from the monks’ original notes, she has crafted a delicious golden-orange nectar that is port-like in character. 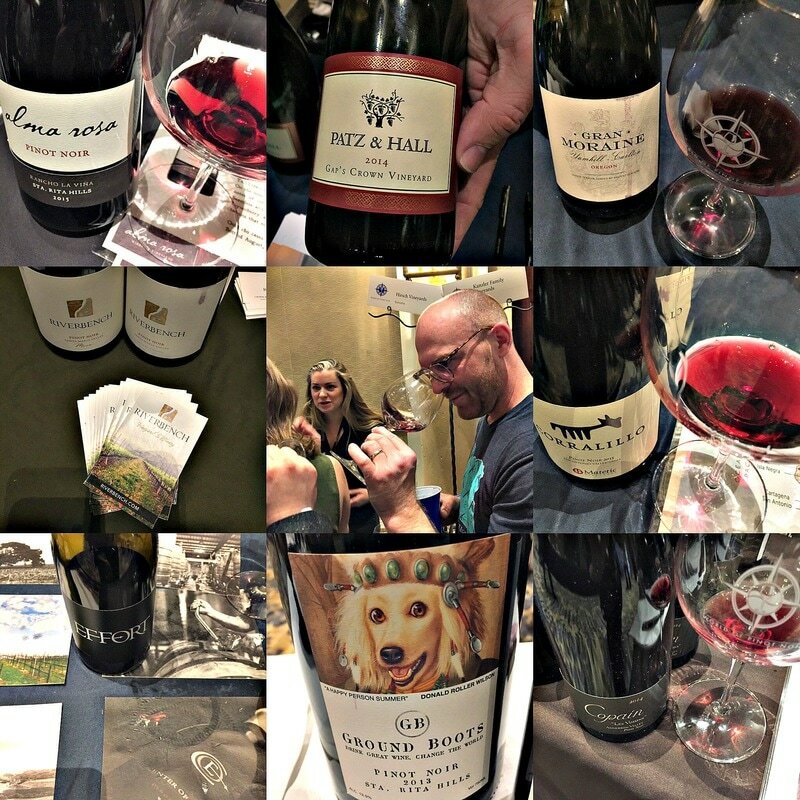 Kosta Browne - Capturing critical acclaim for their rock star wines, there is a reason that these single vineyard Pinots generate so much excitement. Layered, concentrated, and textured, the Giusti Ranch, Gap’s Crown, and Keefer Ranch are standouts. Lumen - Making wine in the Santa Maria Valley for over 30 years, Lane Tanner is a legend, as the first female winemaker in Central California. She and Will Henry make lively, complex wines that are lower in alcohol. 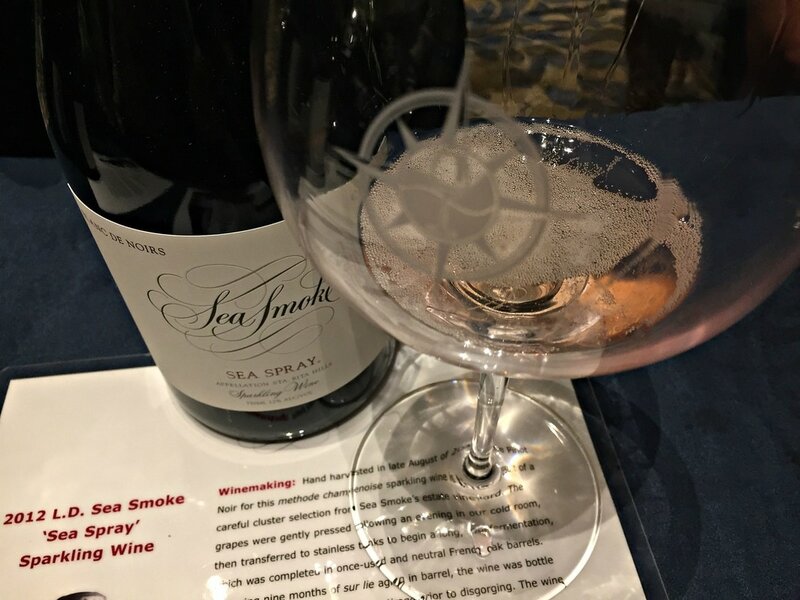 The top notch Sierra Madre Vineyard Pinot Noir was poured in two vintages, 2013 and 2014, along with the Santa Maria Valley Pinot, a blend of 13 vineyards that is both savory and funky, in a good way. As a treat, the sensual 1996 Lane Tanner Julia’s Vineyard was sampled, what Tanner likens to the “mysterious woman sitting at the back of the bar”. 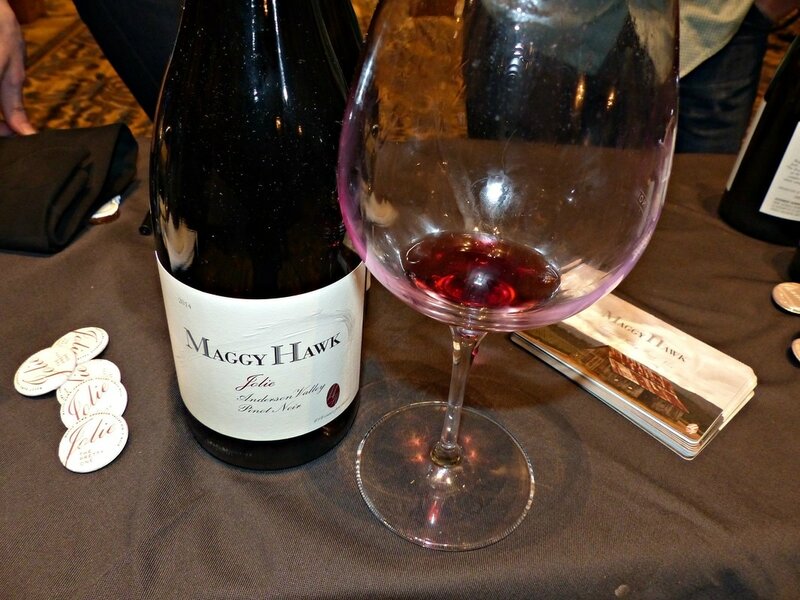 Maggy Hawk - Named after a champion racehorse, the wines are made from single blocks within single vineyards and single clones, and the bottles, named for Maggy Hawk’s equine offspring. Jolie is floral and nuanced, so elegant and beautiful! Pellegrini - This fourth generation winemaking family makes small lot wines, the Hurst Vineyard, Toboni Oakwild Ranch, and Russian River Valley bottles are deeply satisfying. The 2014 Olivet Lane Vineyard Pinot, sourced from one of the oldest vineyards in the Russian River Valley, is a winner, its complex dark fruit and spice captured the Gold Medal in the San Francisco Chronicle wine competition. Sea Smoke- The hype is true, these Sta. Rita Hills single vineyard, small production wines are magnificent. The 2012 Sea Spray sparkling wine has finesse and length, and the brooding Ten Pinot Noir is a knockout. 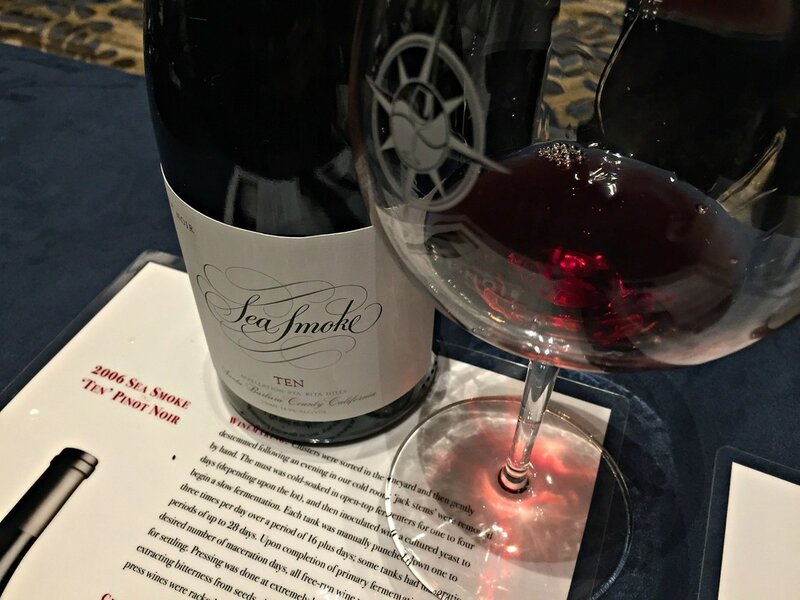 Ten Acre - Specializing in small lots of single vineyard Pinots from Russian River Valley, owner Scott Adams and winemaker Michael Zardo have added a new one to the list, the stunning Three Perch Sonoma Coast Pinot Noir. 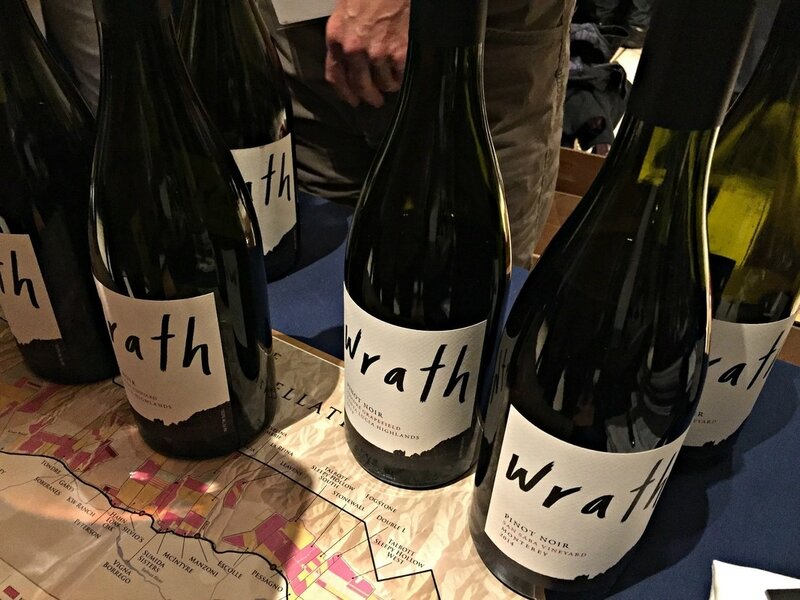 Wrath - An extensive and fascinating experiment with clones, single vineyards, and winemaking techniques has yielded many distinctive Pinots for this label. The earthy, dark fruited Tondré Grapefield, mineral Boekenoogen and vibrant San Saba Vineyards Pinots are fabulous, as well as the bright and savory Ex Anima Pinot. Penner-Ash - Making several single vineyard Pinots from the best areas of the Willamette Valley, this husband and wife team offer distinctive wines that are rich and textured. The subtle and savory Shea Vineyard allowed the bigger and more complex Willamette Valley Pinot to steal the show. Gran Moraine - These nuanced wines are more floral and mineral, with darker fruit and earth notes. Wild berry fruit, herbs, and spice give way to mushroom and forest floor, evoking Burgundy in the glass. The 2014 Yamhill-Carlton, a blend of vineyards, is elegant and balanced. 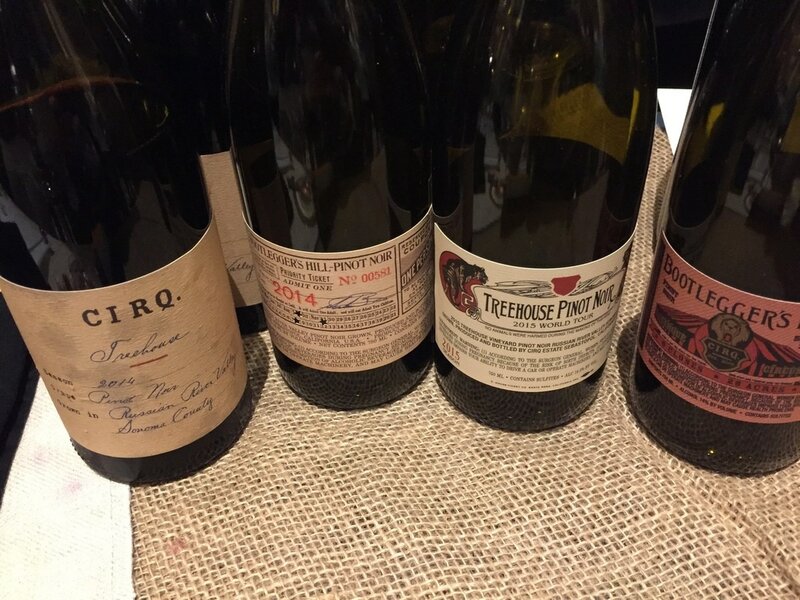 In addition to the main tasting events, the 2017 World of Pinot offered a perk for those in attendance. The “Pinot and Pâté” seminar showcased the expert talents of Fromagerie Sophie’s dynamic husband and wife duo, Paul Doering and Sophie Boban-Doering, alongside three winemakers, Greg Stach of Landmark Vineyards, Greg Morthole of Davis Bynum, and Megan Gunderson of Walt Wines. 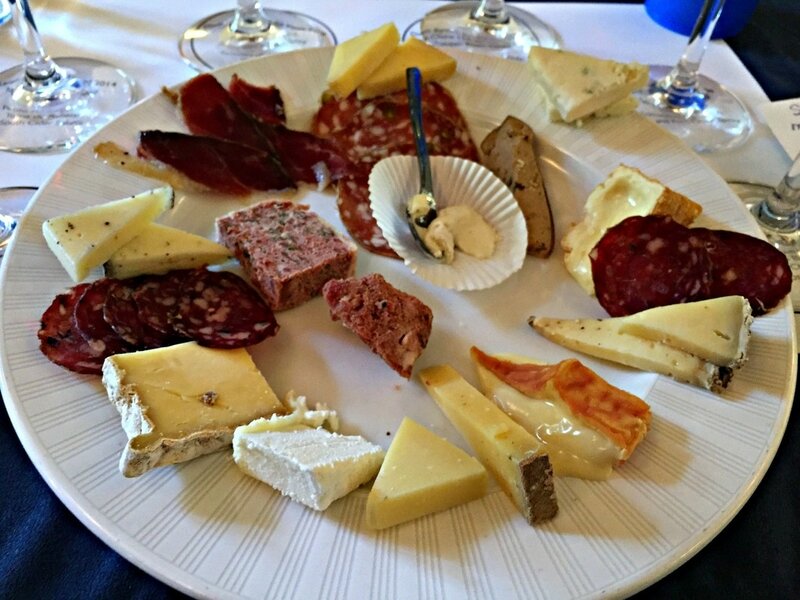 Ten amazing cheeses, from France, England, Italy, and Sweden, populated the plate alongside seven exotic charcuterie, made up of terrines, pâtés, and cured meats, mostly from Smoking Goose, an Indianapolis bastion of innnovation! 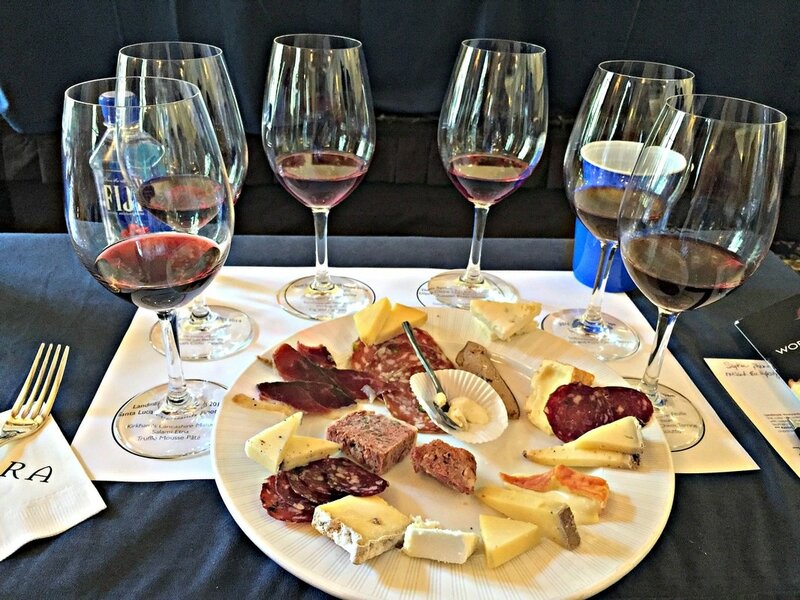 Six Pinot Noir wines, two from each producer, were expertly paired with the meats and cheeses, of which moderator Matt Kettman helped select. The Davis Bynum Jane’s Vineyard Pinot from Russian River starred in one of the best pairings, Epoisses de Bourgogne and Wrangeback cheese with a Pig and Fig Terrine, while the Walt Clos Pepe Vineyard Pinot rocked the Sottocenere al Tartufo cheese and Rabbit and Pork Cheek Terrine. While everyone may have had different favorites, it was clear that Pinot Noir’s lighter tannins made for a better cheese and wine experience, and the older the wine, the better. Tantalizing and temperamental, Pinot Noir has captivated all who have ever drank or made Pinot wines. The World of Pinot Noir brings together a sampling of some of the best wines around, with their passionate producers, for this fabulous annual event. 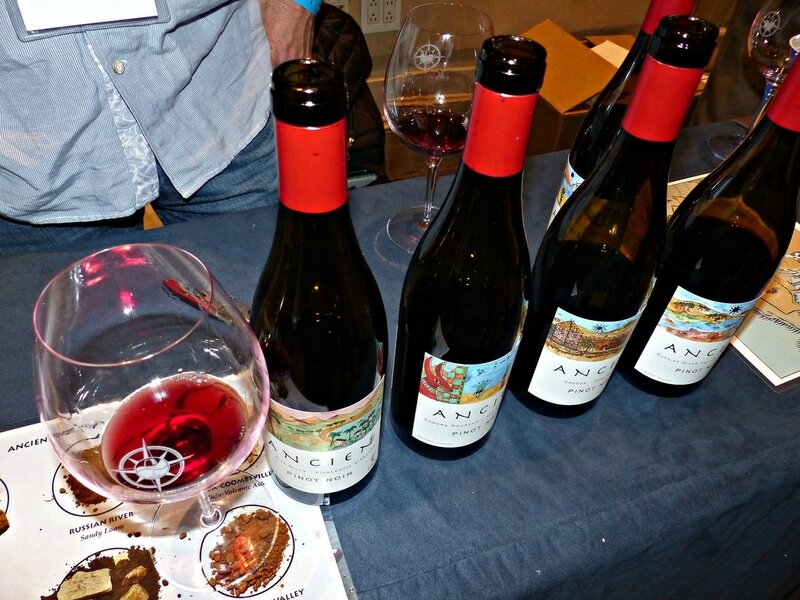 It’s truly unlike any other tasting, as you have the opportunity to taste, compare, learn, meet the winemakers, and get hooked on the lifelong pursuit of Pinot Noir!